In Sikhism, Kesh (sometimes Kes) is the practice of allowing one's hair to grow naturally out of respect for the perfection of God's creation. The practice is one of The Five Kakaars, the outward symbols ordered by Guru Gobind Singh in 1699 as a means to profess the Sikh faith. The hair is combed twice daily with a Kanga, another of the Five Ks, and tied into a simple knot known as a Joora or Rishi knot. This knot of hair is usually held in place with the Kanga and covered by a turban. Kesh is a symbol of devotion to God, reminding Sikhs that they should obey the will of God. Bina kesh hech ast jumla nishan. [These five letters of K are emblems of Sikhism. 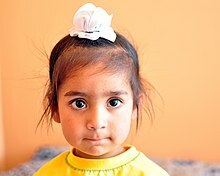 By not cutting hair, Sikhs honor God's gift of hair. Kesh combined with the combing of hair using a kangha shows respect for God and all of his gifts. So important is Kesh that during the persecution of Sikhs under the Mughal Empire, followers were willing to face death rather than shave or cut their hair to disguise themselves. The people are devout; not cutting their hair is/has been an emblem of their goodwill. In modern times the trend of short hair has encroached upon this tradition. It is estimated that half of India's Sikh men have abandoned the turban and cut their hair. Reasons include simple convenience (avoiding the daily combing and tying), because their parents cut their hair and they decided to get their hair cut as well, and social pressure from the mainstream culture to adjust their appearance to fit the norm. After the attacks of September 11, 2001, Sikhs in the West have been mistaken for Muslims and subjected to hate crimes. Balbir Singh Sodhi, a Sikh living in Mesa, Arizona, was shot to death on September 16, 2001 when he was mistaken for a Muslim. In 2007, an 18-year-old Pakistani, Umair Ahmed, forcibly cut the hair of a 15-year-old Sikh boy Harpal Vacher in a US school. In 2008, he was convicted by the jury of "second-degree menacing as a hate crime, second-degree coercion as a hate crime, fourth-degree criminal possession of a weapon, and third-degree harassment." In 2009, Resham Singh, a Punjabi student in Melbourne, Australia, was attacked by a group of teenagers who tried to remove his turban and cut his hair. In 2010, Basant Singh, a Sikh youth in Penang, Malaysia woke up discovering his hair was cut by 50 cm when he was asleep in his dormitory while serving the Malaysian National Service Training Programme. The incident traumatised the youth and is under probe ordered by the Defense Ministry. In September 2012 a member of reddit uploaded a picture of Balpreet Kaur, a young Sikh woman, mocking her facial hair. She responded in a calm manner, explaining the reason behind her appearance and the original poster apologized. It then went viral. ^ Gupta, Hari Ram. History of The Sikhs - The Sikh Gurus 1469-1708 (2008 ed.). New Delhi: Munshiram Memorial Publishers. p. 275. ISBN 978-81-215-0276-4. ^ Young Men Get Haircuts, Annoying Their Elders. New York Times. March 29, 2007. ^ "Indian Immigrant Killed in Ariz.; Man Charged in Slaying and 2 Other Attacks; Racism Suspected". Washington Post. September 17, 2001. ^ "Aussie teens try to cut Sikh youth's hair". Times of India. June 30, 2009. ^ "Minister orders probe into 'cutting' of Sikh boy's hair". The Star. January 19, 2010. Archived from the original on January 22, 2011. ^ Swash, Rosie (September 26, 2012). "The Sikh woman who stood up to online abuse about her facial hair". London: The Guardian. Retrieved 27 September 2012.